It has been brought to our attention that there is a bootleg just been released and is allegedly being distributed by a well known company. We can categorically confirm this bootleg release is nothing to do with either Leatherface or Big Ugly Fish Recordings. It is unlikely that any of the band will receive any payment from the sale of such releases. We ask all true fans of the band’s music to avoid such inferior products. The official releases can only be bought from reputable traders or direct from Big Ugly Fish Recordings’ website. First of all, happy seasonal holidays and a big thanks to you, friends and family that have supported us over the last year. Big Ugly Fish Recordings are proud to announce our second release BUFCD2 in 17th January 2010. You’ll be able can pre-order your copy of this release from the Big Ugly Fish Cornershop in the new year and we’ll let you know as soon as it is a available (UK and Europe P&P included. Rest of the World P&P £6.00). To win a Leatherface T-Shirt and Red Vinyl LP just go to our competition page and answer this simple question: Who is the drummer who plays on ‘The Stormy Petrel’ album? Enter here. ‘Indestructable’ by Jessie. Click here to download. Best wishes for the festive break. Sunday 12th – Sando Hotel, Sydney. 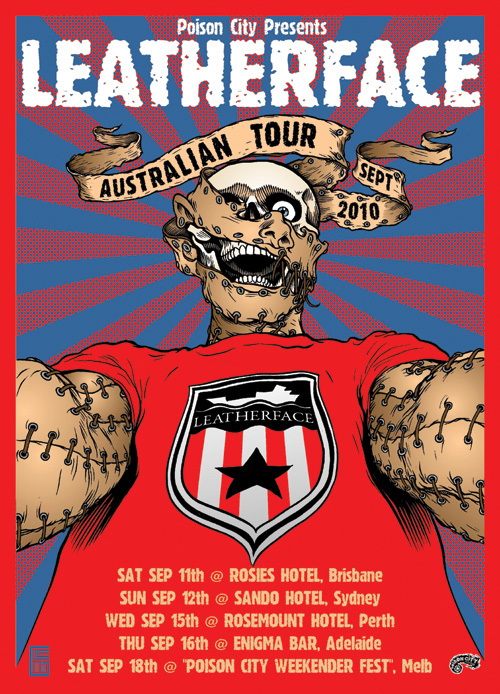 Wednesday 15th – Rosemount Hotel, Perth. Saturday 18th – “Poison City Weekender Festival”, Melbourne. With A Death In The Family + more! There is just a handful left of both ‘Deep, Deep, Sleep’ – Leatherface, with a track by Ninja Gun – ‘Eight Miles High’ in yellow vinyl and Leatherface – Deep, Deep Sleep / Yesterdays Ring – Julie, Julie, Julie limited edition split single in red vinyl. So get them while you can because once they are gone you’ll have to take out a second mortgage to get your hands on them through the auction web sites. Due to popular demand we are pleased to announce another limited edition 7inch split for the second U.S. tour in May/June. Due to the success of the first split single with Yesterdays Ring, Big Ugly Fish Recordings will release BUFV002 – ‘Deep, Deep, Sleep’ – Leatherface, with a track by Ninja Gun – ‘Eight Miles High’ in yellow vinyl. Once again, there will be only 500 pressed and Ninja Gun will be playing with us for the whole tour. More dates are yet to be announced for this tour, so keep an eye on the site or join our mailing list for the latest news.